Elko Blijweert and Joris Caluwaerts made the original soundtrack for ‘Monkey Sandwich’, a film by Wim Vandekeybus. The movie tells the story of a troubled director who is haunted by his guilty conscience through surreal dreams. These dream sequences were mainly based on urban legends. 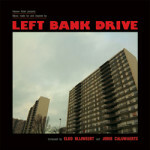 Using the moniker LEFT BANK DRIVE, Blijweert and Caluwaerts, release most of the soundtrack as well as some outtakes on this eponymous album on Heaven Hotel (www.heavenhotel.be). The music ranges from eerie soundscapes to blissful melodies that evoke the surreal dreams of the main character in an introspective yet moody and sometimes elegiac manner.